The native American horse chestnut trees are called buckeyes. American Indians prepared the starchy buckeye seeds for food by roasting and washing them thoroughly to remove the poison. They also made a powder of the raw seeds and threw it on the water to stupefy fish. Hippocastanum vulgare is the sweet chestnut and is not related to the horse chestnut. It is said that the prefix “horse” comes from the Welsh gwres meaning hot or bitter, to differentiate it from the “sweet” chestnut. The word esculus is derived from esca, meaning food. The bark, fruit, and seeds of horse chestnut have all been used for healing. A tonic can be made from the bark and used for fevers. Historically, the bark has been used externally for ulcers. The fruits are widely used for rectal complaints and for hemorrhoids. It is an astringent and is believed to tone and strengthen the vein walls. 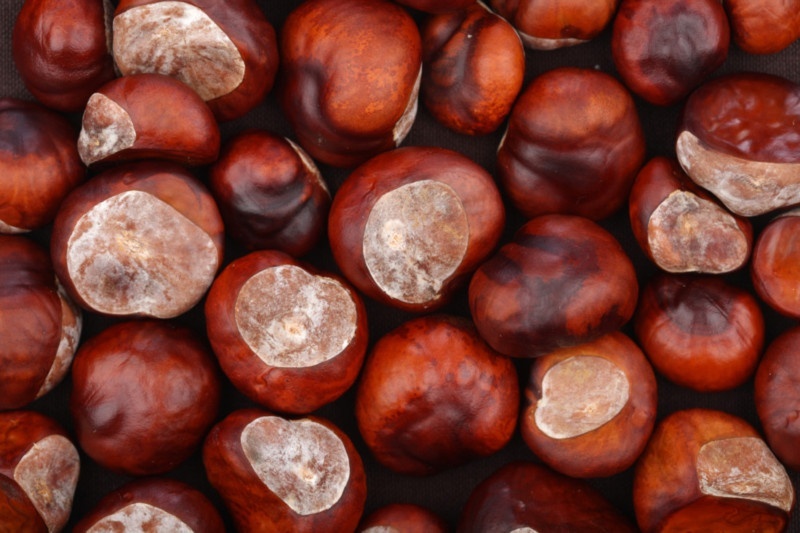 Horse chestnut has a positive effect on all skin it is applied to, so it is a perfect ingredient in astringents. It contracts the skin and is, therefore, especially valuable for people with enlarged pores. Because it is very soothing and moisturizing to the skin, it is a benefit in any lotion or cream. It is also found in many anti-cellulite and cell-rejuvenation products. It is useful in lotions for sensitive skin and products that lighten the skin. Chemical constituents: Escin, saponins, flavonoids, tannins, and coumarins.